School House, a boys’ boarding house, is on the north-eastern side of the Mint Yard. It was opened in 1864, replacing the old Almonry building, which was then demolished. From the 1860s until c1901, School House was the only boarding house, though there were also dormitories in what later became The Grange. The Headmaster was the housemaster, originally living in what became the separate Galpin’s House in 1952. 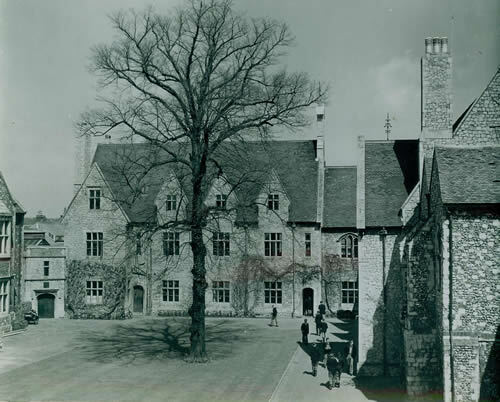 From 1935, School House had its own housemaster, though John Shirley acted as housemaster for a time in the War. Girls were attached to the house from 1974 to 1990. Housemasters: [Headmaster] Edward Wall (1935-36), Gerald Bennett (1936-39), Geoffrey Lampe (1940-41), Revd John Shirley (1941-42), Stanley Poole (1942-46), Kemlo Gross (1947-52), Richard Paynter (1952-63), John Goddard (1963-73), John Sugden (1973-85), Stewart Ross (1985-89), Andrew Dobbin (1989-2000), Bill Browning (2000-06), Matthew Thornby (2006-18), Adam Vintner (2018- ).